Large (2T-4T) - $48.99 Only 5 left! We have always adored a toddler who adores flamingoes. Toddlers usually love the big and fluffy animals. Dogs and cats. Bears and Lions. Horses and Unicorns. But a kid who loves a flamingo? That child has something interesting to say about the world...and we are all ears! Let you kiddo become their favorite animal this Halloween and you will not be sorry! 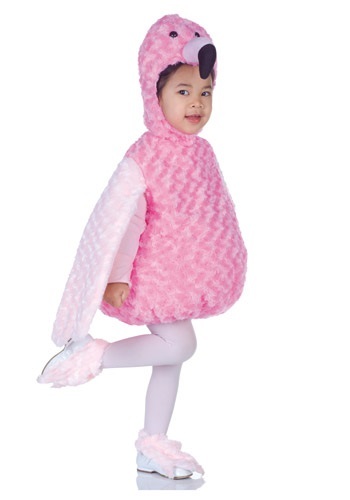 They will be so ecstatic it will be truly heartwarming to watch, not to mention that in this Toddler Flamingo Costume, they will spend dozens of hours just practicing standing silently on one leg. How nice and peaceful for you! The other benefit of having a flamingo around the house is that you will always feel like you are in the middle of a tropical vacation, even long after Halloween is over! Having a bout of seasonal affective disorder? Just ask your kiddo to wear this cute costume around the house and your spirits will instantly lift! The whole look is graceful and awe-inspiring, just like the flamingo itself. It’s a pink padded dress with soft little wings, matching shoe covers, and a hood. The swirled bright pink faux fur is soft and cuddly and the bright hue will enliven any trick-or-treating session, tropical theme party, or even a cold February night! Add our flamingo purse as a treat carrier for twice the dose of sunshine and unique charm!